Resident artist Fred Peters welcomes you to his Kingscote gallery studio. Click to view a small selection of his sterling silver jewellery. I should probably always have been an artist – art and metal and woodwork were the only school subjects I enjoyed – but my first careers were in building design and social work in Adelaide before I moved to Kangaroo Island. 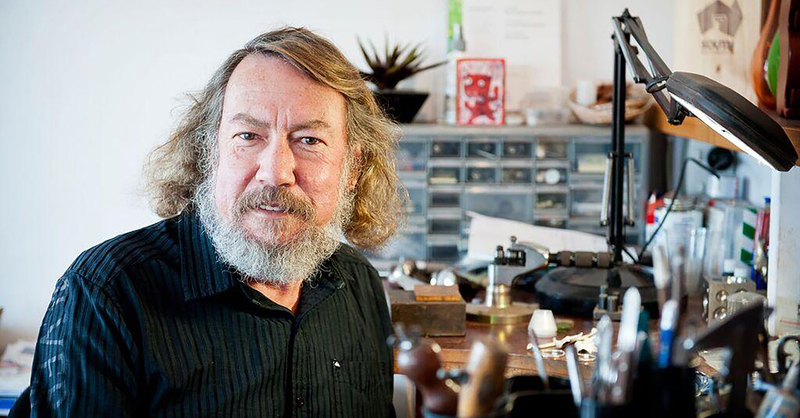 Kangaroo Island artist Fred Peters is known worldwide for his unique ability to interpret Kangaroo Island’s natural beauty through fine sculptural pieces and sterling silver jewellery. For Fred, every day brings new opportunities to see how profoundly his work touches others. Talking with international visitors in his gallery studio as they choose the piece that forever connects them with Kangaroo Island, or recognising his work as it rests beside the heart of an islander, Fred is constantly reminded. His work moves people: it brings forth sudden exclamations and generates excited whispers; lays bare complexities of nature; and it brings so many back. If you own a piece of Fred Peters’ sculpture or sterling silver jewellery, there’s no doubt you’ll understand what we mean. It’s no mistake Kangaroo Island is the place where Fred found the perfect expression of his creativity. For every artist it seems, there is a place whose creatures, landscapes, sights and sounds are a special inspiration. Where life and art are so intertwined, the connection is undeniably spiritual. For Fred Peters, Kangaroo Island is that place. Chat to Fred in person when you visit us at our gallery in Kingscote. Easily the most sought-after of Fred’s work are those pieces incorporated in his Trees series. Available in a range of sizes, and with a range of chains, you will find these sterling silver pendants on display right inside the door of Fred’s Studio in our Dauncey Street gallery. As resident artist at Fine Art Kangaroo Island, Fred is most often on-hand to meet and talk with visitors to our Kingscote Gallery. He has also exhibited in each of our annual themed exhibitions for the SA Living Artists (SALA) Festival at the National Wine Centre.